Minimalist interiors draw attention to the open kitchen of this Japanese restaurant, which Takenouchi Webb has created inside an old Singapore shophouse. Decked out with pale timber surfaces and pared-back furnishings, Esora has been designed to give centre stage to the dining experience. It is located in Singapore's River Valley district, and was formerly a shophouse – a common building typology seen around Southeast Asia that combines a workplace with a residence. The 26-cover restaurant will serve Kappo-style Japanese food under the guidance of chef Koizumi. Translating to "cut and cook", Kappo involves a chef openly preparing a multi-course meal in front of diners so that they can observe and appreciate the culinary process. 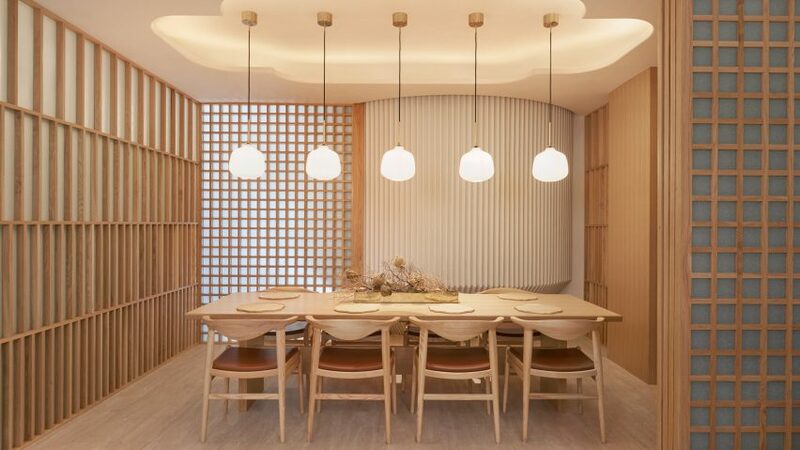 "As the restaurant was to be arranged around the chef's table, this became the centrepiece of the restaurant," explained locally based studio Takenouchi Webb, which was charged with developing Esora's interiors. "Through our discussions with the chef and the client, we slowly developed the language of materials and form of the space." 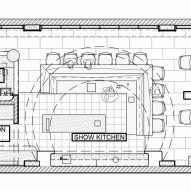 The ground floor is now centred by a cooking space, which is enclosed by an L-shaped wooden block of seating. Part of the flooring here has been lowered so that the chef must step down to use the prep counter, aligning his eye level with diners and fostering a more intimate atmosphere. Overhead is a semi-circular glazed opening that has been overlaid with Japanese washi paper, diffusing natural daylight in what the studio describe as a "cloud-like" manner. At the rear of the room is a small kitchen decked out in jade green tiles and a drinks bar crafted from veiny grey marble, where guests can take part in a tea-pairing experience. The bar's curved form, coupled with the arched grooves in the ceiling, is meant to give the restaurant a sense of "underlying calm". The rest of the restaurant accommodates a couple of four-seater tables and a private dining room that can be completely closed off by sliding gridded screens. Five pendant lamps are suspended from the ceiling in a row, emitting a warm yellow glow. Decor has been restricted to a few abstract paintings, copper cooking pots, and vases filled with pampas grass and white-budded honesty flowers. Sinapore's few remaining shophouses are often granted heritage listing, encouraging studios to carry out imaginative refurbishments. Back in 2015, WOW Architects converted one of the buildings into art and design venue, which has rugged brick interiors. Photography is by Jovian Lim.